Click here or my YouTube videos on salvation. God includes Muslims in His plan of salvation according to the Catholic Catechism (para. 841). This paragraph states that the Muslims "together with us adore the one, merciful God", in spite of the fact that the Quran declares that the God of Islam did not have a son (Surah 4:171). Catechism Comments gives the paragraph references to many other false doctrines contained in the Roman Catholic Catechism. The Roman Catholic church pronounced over 100 curses on those (Protestants) who oppose their doctrines. This occurred at the Council Of Trent in the 16th century and has never been rescinded (search the PDF for the word anathema). Rather, at Vatican Council 11, in the 1960s, doctrines of Trent were ratified; there has been no change of mind (see page 164, para. 51 and page 242, para. 55). Cries that the Roman Catholic Church (RCC) has changed are baseless ... see Has Roman Catholicism Changed? and the 1998 Papal statement Faith And Reason. The Creed By Pope Pius IV is the official Roman Catholic confession of faith and clearly outlines the unscriptural doctrines of Catholicism and the belief that there is no salvation outside of Rome and its Traditions. 1) Are not taught the truth of salvation. (The teachers of the false gospel of Catholicism are condemned by Gal 1:8-9). 2) Don't believe that faith and repentance alone will bring forgiveness and eternal life, but that a non existent Purgatory may be necessary to cleanse them (Catechism, para. 1030). 3) Are encouraged to pray to Mary and other dead Saints which is the occultic sin of Spiritism (see Deut 18:9-13). 4) Call Mary 'Mediatrix' and 'Advocate' in direct contradiction of God's word in 1 Tim 2:5 (Catechism, para. 969). 5) Worship the Eucharist as the body, blood, soul and divinity of Jesus (Catechism, para. 1374) ... blasphemous idolatry. 6) Say that Jesus is immolated (killed as a sacrifice) at each and every mass (Council Of Trent, page 171). 7) Believe that the Eucharist makes reparation for the sins of the living and the dead (Catechism, para 1414). 8) Have a doctrine of works whereby they 'merit' their way to heaven, ignoring Eph 2:8-9. I'm sure there are saved individuals attending Catholic churches but their salvation is in spite of RCC doctrine and not because of it. Such individuals need to witness to their Catholic friends and separate themselves from Catholicism just like a Muslim convert needs to depart Islam entirely when he is saved. Catholics need to be guided to the truth that salvation is through repentance and faith in Jesus alone, apart from any denomination, and each person should know for certain that they are saved because 1 John 5:13 says, "I write these things to you who believe in the name of the Son of God so that you may KNOW that you have eternal life". Jesus alone is our hope of salvation as 1 Tim. 2:5 says, "For there is one God and one mediator between God and men, the man Christ Jesus". An individual can and should know that he is saved. If a person is not certain of salvation then there is a very strong possibility that they are not saved. Click here to go to the article How Do We Know If We Are Saved? In John 10:27 Jesus said that He knows His disciples because they hear and follow His voice. For a small article on hearing and following the Lord's voice, go to The Way Of Peace. Jesus also said that we must be born again to enter the kingdom of heaven. Click here for a little article on being born again. Test All Things, by Joe Mizzi, is a good little book on understanding Catholic beliefs ... click here to download it. Please go to The Ecumenical Movement to see how the Pentecostals 'created' the Charismatic Catholics, so providing common ground to bring about their unity. The following three videos concern the Roman Catholic Church. 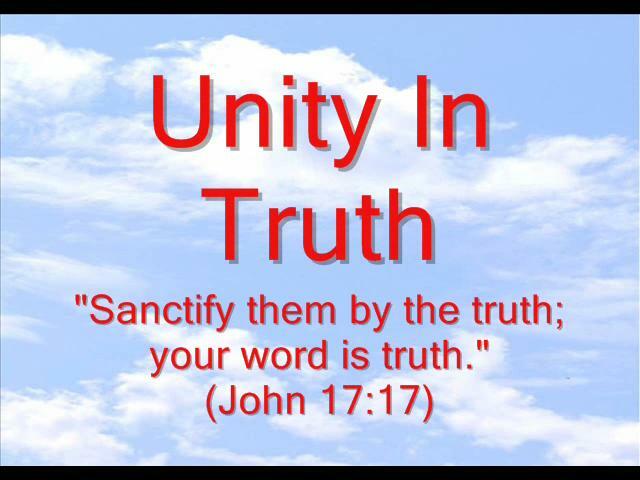 Unity In Truth - A short video on the Roman Catholic Church and the Ecumenical Movement. 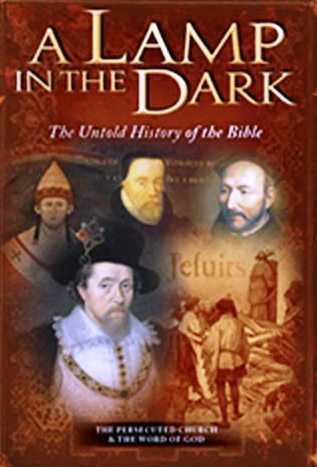 A Lamp In The Dark is three hours of church history and is well worth watching. 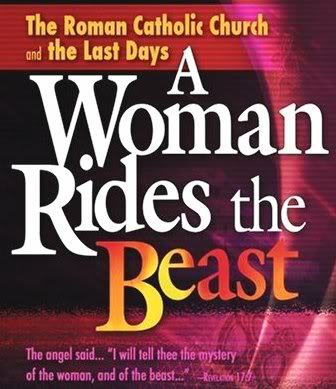 A Woman Rides The Beast reveals who the woman on the Beast is in Revelation 17.